In this column I will dive into times, throughout superhero history, that comics got political. There seems to be a constant debate if political discussion has a place in the medium. I hope to show that politics and superhero comics go together. This time we look at the first Social Justice Warrior in comics, Superman and Action Comics #1 AGAIN? The problems and issues with the new 52 reboot are vast and complicated. On one hand it was the first time DC comics was able to top Marvel in the sales charts. On the other hand the new continuity was messy, inconsistent, and many were deeply upset with their characters being represented in new and unfamiliar ways. The main critique was everything became grim and gritty again. Things were dark and serious rather than light, and inspirational. There was at least one comic that did buck this trend and that was Grant Morrison’s Action Comics run. The New 52 really upset people with Superman’s costume redesign. Gone were the red trunks, replaced with a high collared blue suit. There are few costumes that are more iconic than Superman’s (which has been relatively unchanged since 1938, outside a weird electric blue costume). In Action Comics however, Superman did not wear this new redesign. Instead he had a simple T-Shirt, jeans, and a cape. It was a very slap dash costume, but it served a purpose. Rather than out-worldly adventures this comic started on the streets. 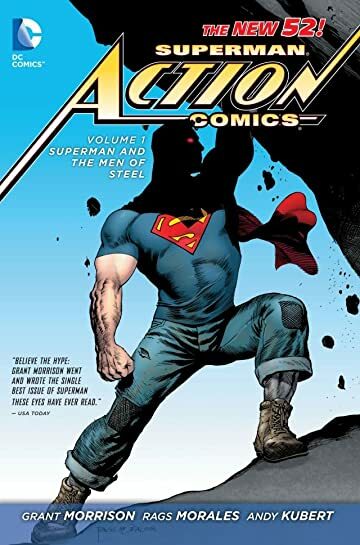 Much like how Action Comics #1 (1938) posed Superman as a hero for the common person, the 2011 version recaptured that same feel. Having this simple costume made Superman look and feel more like a blue-collar hero. Rather than looking outlandish and out of place, he seemed far more approachable and inspirational. There are no big super villains in this comic, no aliens (other than Superman), and no Kryptonite. The comic starts with Superman taking out a rich businessman who is taking advantage of the people. He forces him to confess that he used cheap foreign labour, subverted safety standards, and bribed government officials. Already in the first few pages we know where Superman stands. This comic hit the stands around the same time as Occupy Wall Street, a large social movement that attempted to shed light on the abuse of power carried out by the richest in society. At a time we badly wanted to take those people to task, Superman was throwing them off rooftops and scaring them into confessions. Unlike Batman, Superman did this all with a smile on his face and in broad daylight. He did not hide, he inspired. This is seen again later in the comic where he saves a group of squatters in an abandoned building. Lex Luthor (who is clearly another stand in for the 1% being a rich consultant for the American Military here) schedules the demolition knowing it will tease out Superman. He is able to save the people but the government sends in tanks and a variety of weapons to take him out. The people surround Superman in protest and protect him, allowing him to escape. This shows that people do not fear him, but look up to him. The people are willing to stand up for what is right because of the example Superman has set for them. While Superman was modernized but wholly recognizable from 1938, Clark Kent gets a bigger overhaul. He is still shown as meek and weak in his appearance, but is presented as a hero rather than a “foil.” It is brought up that the work he does as a reporter saves lives. He exposes corruption as a reporter and fights it as Superman. He is also shown living paycheck to paycheck and seems to have trouble being on time with paying his bills. All of this makes Clark Kent as inspiring as his alter ego. The team of Rags Morales and Grant Morrison effectively took the politically charged depression era Socialist Superman, and made him relevant to a modern audience. While he has evolved the main thesis of the character remains. Superman is a beacon of hope for the fictional society he lives in and a role model to follow in our world as well. A truly timeless character.